With the boom of mobile marketing and the evolution of the mobile phone, you’re missing out on a goldmine of marketing potential if you haven’t jumped on the SMS text message marketing train. SMS stands for ‘short message service’ (aka text message), and it allows you to send a message of up to 160 characters to another device. It’s a great way to provide targeted messaging to people who have already agreed to receive promotional messages from you. SMS can be utilized to create a relationship with your fans, provide offers, and share contests/ sweepstakes. Though SMS is ideal for local businesses, it can be utilized for franchises if targeted, location-based campaigns are used. In this guide, we’ll go over requirements for SMS campaigns, tactics to ensure you get the best ROI, and a case study that proves its effectiveness. Not surprisingly, it was the cellular service providers themselves who began utilizing text marketing first. They already had the technology and access, so it was a cheap way for them to reach customers. In 2003, short codes for use with text message marketing were introduced. In 2005, major brands, like Nike’s Times Square design, launched SMS campaigns. By 2007, the number of active SMS users hit 2.4 billion, causing several brands to implement SMS text marketing tactics to join the trend. Customers can join your mobile database by texting a keyword from their mobile phone (M.O./mobile-originated message). These qualify as proof of written consent. They can also join by filling out an online form, though this form must explicitly explain what content the person will receive. You may also be responsible for cataloging these mobile numbers. The final option is a paper form, which also requires a clear explanation of what the customer is signing up for. In addition, you’ll need to include all legal copy. You should let your subscribers know what they’re signing up for. Inform them how frequently you’ll be sending out messages, the program’s name, and what content you’ll be sending. For frequency, a good number to stick to is 2-4 texts/month. However, this number really depends on your business and the rate of your promotions. Get permission before proceeding with a text message relationship, and include any disclaimers that may apply (ie: standard text message rates). Make it easy for users to opt-out of your SMS message alerts (ie: reply STOP). Make sure you’re providing value to your recipients. This might be through text-to-win, text-to-vote, text-to-join, text coupons, text reminders or auto responses. Don’t use old, rented or purchased lists, since these people haven’t given explicit permission for you to send them messages. Finally, be sure to use short-hand sparingly, since your message can get lost in translation if the recipient isn’t as familiar with text lingo. Use plain language, so you don’t isolate anyone who may not understand what you’re saying. Not only do you want to target the right people, but you also want to target them at the optimal time for conversions. As a good rule of thumb, only text during business hours. Midnight texts are reserved for family emergencies! Avoid sending messages on Mondays, since they have the lowest response rate. Also, steer clear of rush hour (6:30am-8:30am, 5:00-7:00pm). People can’t engage with a text during those times, so you’re wasting your message. Appointment reminders (pictured below) should be sent 24 hours before the appointment. Ongoing reminder messages should occur on either a daily or monthly basis (depending on the original agreement) and should be sent at the time of day that’s the most likely to result in conversions. An example of this might be a horoscope sent every morning at 8am. To draw in midday foot traffic for a lunch hour boom, send messages at 11:30am. This is also a great time to offer coupons. For in-store weekend foot traffic, Thursday and Fridays between 2 and 5pm are ideal. Event reminder texts can increase your RSVPs and attendance for events. Be sure to throw in specific event info, like time, parking and place. If you’d like to send out holiday-specific messages, shoot for one week in advance to the date. This allows ample time for planning. In order for SMS text message marketing to work, your recipient has to be able to receive text messages. Those who don’t have a smartphone with that capability will be missing out on your offers. You also have to limit the number of characters you send to 160 (depending on the language of your text). You have the option of splitting your promotion into multiple messages, but keep in mind that this increases the cost. Legal issues are also important to consider. The Federal Communications Commission (FCC) regulates interstate and international communications by radio, televisions, wire, satellite and cable in the US—this includes text messages. The Federal Trade Commission is the country’s consumer protection agency, which catalogs complaints about companies, business practices, and identity thefts. They also ensure text marketers follow proper business rules and conduct. Some people also find this marketing tactic to be invasive, so it’s imperative that you get permission before sending out texts. A great aspect of SMS text messaging campaigns is that you have a pre-existing relationship with the customer simply by them agreeing to receive text messages from you. Since 98% of texts are opened and 90% are read within three minutes, you can send out time-sensitive content (ie: BOGO tacos TODAY ONLY) right when you’re most likely to land a conversion. Research has shown that consumers are ten times more likely to use a brand offer made over their mobile device versus a print coupon. There are more than 54 million consumers who respond to SMS offers every year, which means it’s obviously an effective tactic. Since it works as a subscription services, you can create brand loyalty and encourage repeat customers. This can be worth a lot more than one-time acquisitions. If you can engage a small group of consumers, you’ve garnered a long-term payoff. There are a few key players in the SMS text message marketing process that you should be aware of, since they can really make or break your campaign. The Mobile Marketing Association is a non-profit trade association dedicated toward expanding all areas of mobile marketing. Mobile aggregators are the guys who connect you with the wireless carriers. It’s their job to deliver their customers’ text messages. They’re the middle man between you and the mobile service provider, ensuring your messages are sent to all wireless carriers. 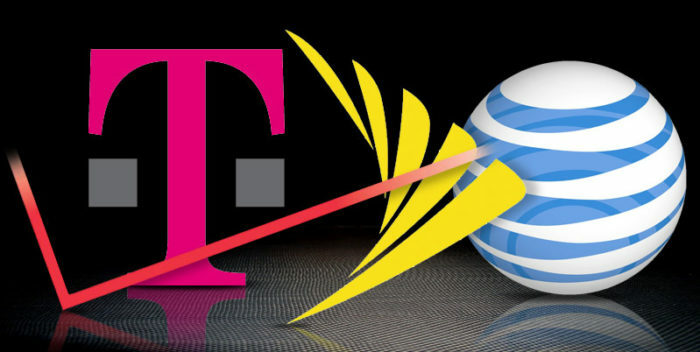 The mobile carriers are the big names you recognize—AT&T, Verizon, Sprint, etc. They are the pipes and wireless spectrum that voice calls, texts, and data must travel through to reach their final destination. The text messaging platform providers are tech platform providers that enable brands and businesses to send text messages to their customers. We’re text message marketers, which means we design and implement text marketing campaigns. These 5 or 6-digit phone numbers enable brands to send commercial text messaging to consumers. Short codes are regulated by set guidelines from the wireless carriers and are enforced by the CTIA. The short code has several keywords associated with the phone number. A shared short code means all people/businesses using the same short code are given their own keyword. This differentiates each of the users of the short code and determines who will receive messages sent to the short number. We lease our short codes, since they can be a very hefty investment. Taco Bell Gains 13,000 SMS Subscribers in 5 Weeks! Taco Bell was able to get this high number of subscribers by advertising their SMS campaign on more traditional platforms, like radio, television and print. Interested individuals were told to text TBIC to 30364. As an incentive, they would receive a text message with a promotion for a free Frutista Freeze with the purchase of any food item. According to this case study by Tatango, Taco Bell tried to “limit the exposure of the promotional offer and encourage immediate action from customers” by utilizing rolling expiration dates in the initial text offer. That way, they could set the expiration date for 3-5 days out from the time that a customer signed up. Throughout the campaign, they sent out over 29,500 SMS coupons. Plus, they retained 93% of their SMS subscribers at the end of the 5 weeks period, indicating that consumers really liked what they were sending out—taco ’bout great text message marketing! Our SMS text message marketing service makes it easy for you to run a text marketing campaign without having to do a thing. You can either word your own messages and send them to us, or we can create unique, eye-catching messages based on our years of marketing experience. We also have a thorough knowledge of all regulations, so you can run your campaign worry-free. Contact us if this seems like a tactic your business could benefit from.